So I am writing this a day after the election and I am absolutely devastated about how completely off track this country has gone. Do you realize if this horrible man actually does get rid of Obamacare and if Michelle would happen to lose her health insurance through work, then she would have a pre-existing condition and she would not be able to get health insurance with pre-existing cancer. Yes this is just one of the many things that scare us. OK back on topic. I have been out of work for three years and I’ve been looking for work and getting little things here and there but it’s been very demoralizing. What makes this so much harder is the fact that Michelle is the one with cancer and Michelle is the one who’s working and I feel absolutely useless and ashamed. And the guilt! My father was Catholic and my mother is Jewish so I suffer from double the guilt and it’s hell! I do my best to take care of Michelle starting her on wheat grass, getting the right vitamins she needs and doing the things that I can do but I just feel so lost. I want to work. I want to bring in money and I want to make a difference. It’s not easy looking for work when the career you loved is becoming obsolete. I’m opening up my options. 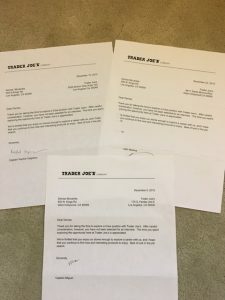 I got not one, not two, but three rejection letters from three different Trader Joe’s. Are you impressed? Last week Michelle started crying and said she’s afraid. I said to her, “but the markers are going down, which is wonderful,” and she said yes but she’s still afraid. She’s afraid of the next chemo, she’s afraid of the cancer, she’s afraid of what the future might bring. And all of that is completely understandable and I try to comfort her and I try not to be afraid. I know everything’s going to be OK, I know she’ll get through this and I have to stay strong for her but it’s not easy. Oh and the fact that we are married makes things so much easier. I can take control and feel somewhat useful. I can call the doctor. I can talk to anyone I want to talk to about Michelle and no one questions it. When she was rushed to the ER I could be right by her side because that’s where I belong. Things could change for us. The new administration that includes a reality buffoon and a born-again Christian vice President wants to take that right away from us. 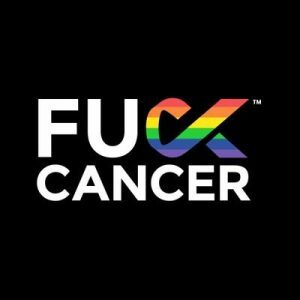 We have a lot more to fear now than just cancer and that is quite enough already. Next story 4TH TIME’S THE CHARM, MRS. DOUBTFIRE, HUMAN PIN CUSHION, AND WHERE DID SHE GO? Previous story SIDE EFFECTS, ANTIDEPRESSANTS, A GIRAFFE, AND GOOD NEWS!